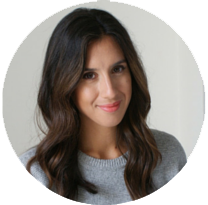 MessyJesse - a quilt blog by Jessie Fincham: Cover Girl! 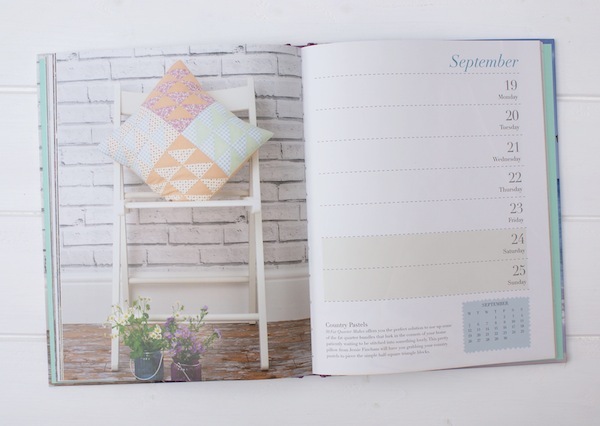 Quilter's Desk Diary 2016 Edition! Cover Girl! 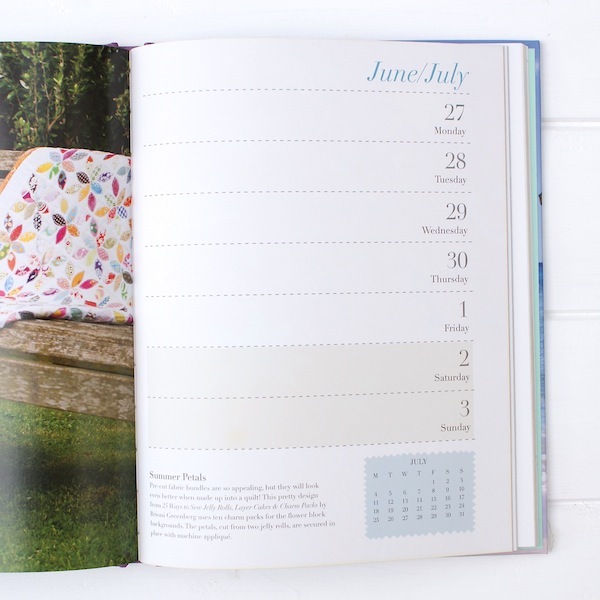 Quilter's Desk Diary 2016 Edition! Would you mind very much indulging me while I brag tell about my cover photo on the front of the new 2016 Quilter's Desk Diary! I was browsing Amazon one morning a few weeks ago and it popped up the 'you may also like' section, (I get caught with that all the time!) I thought, "I recognise that cushion!? Oh, it's MY cushion!". It's an image taken from the 50 Fat Quarter Makes book I contributed to last year, and the same publisher releases this desk diary each year. I'm so honoured to be the chosen photo for the cover, what a compliment! I can tell you, this will be kept in my 'scrapbook' of sorts and enjoyed for many years to come. 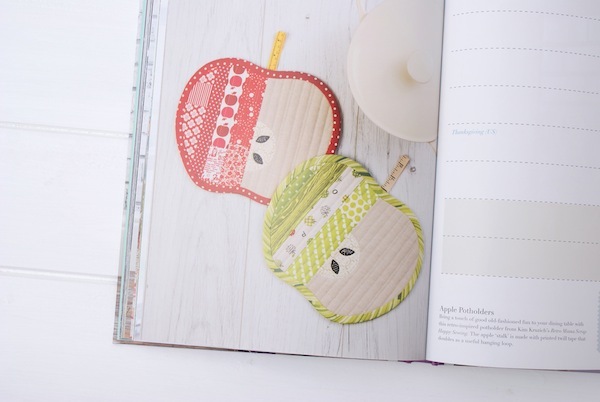 It features lots of inspirational quilts and projects from a wide range of quilters on every page and a week-to-view diary page on the opposite side, with plenty of space for notes and important dates. It also has a full page shot of the brilliant 1718 Coverlet quilt, I just adore this. It's a reproduction made by members of the British Quilt Guild, in commemoration of the original quilt, which is the earliest known British patchwork quilt to have a date worked into the piece. It comes from the fascinating book 'The 1718 Coverlet', there's a Facebook group who are doing quilt-a-long alongside Susan Briscoe, the author. It seems September must be my month? 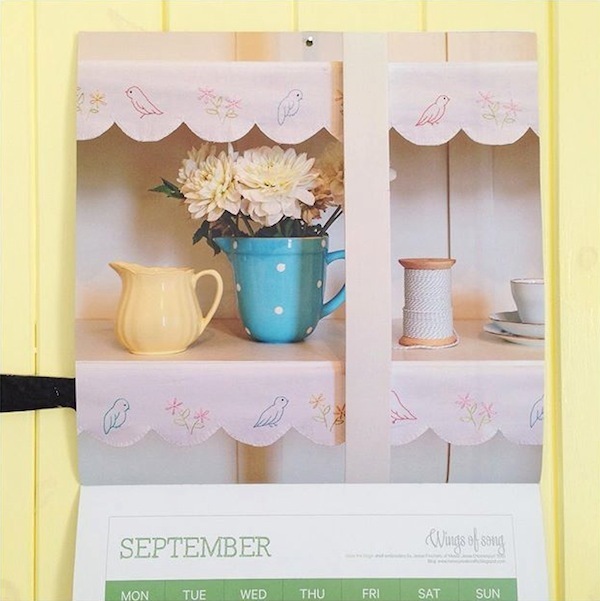 As it's my month in the Homespun 2015 calendar too! This is a project I worked on last year, or the year before? (Wow, has it been that long?) It looks quite pretty hanging on my kitchen pantry. I should probably dig up the shelf edging and display that in my kitchen too! How silly of me. 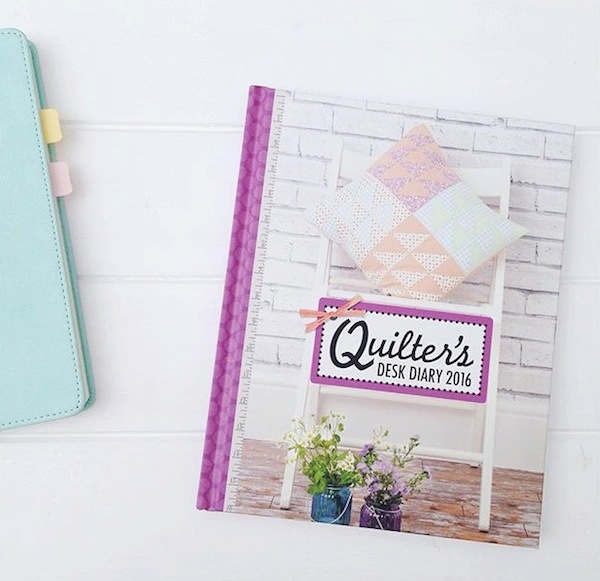 You can find copies of the 2016 Quilter's Desk Diary at Sew and Quilt now. Congrats, Jessie! You're allowed to brag about that and can sure be proud:-) I've added the calender to my wishlist (my ever-growing wishlist I should add ... am I the only one?). Congratulations! How exciting. And how amazing - I've been looking at "September" on my calendar and thinking it's the nicest pic of the year to date (I don't like to look ahead! ).......and it's YOU!! Now that IS nice. Congrats! Love all the projects! A true compliment Jessie, congratulations! Exciting for you! So very pretty and a nice compliment for your gorgeous work! Thanks for inspiring us! Congrats, Jessie! Great keepsakes for your future!